These screenshots provide a glimpse of Blue Ink. For a better idea of how it works check out our Demo, which includes a live application built by Blue Ink. 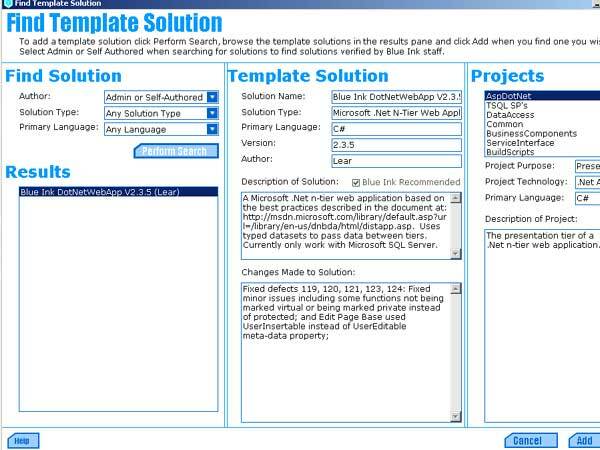 Templates provide the instructions for what to output and are downloaded into a Blue Ink project using the screen below. Automated Architecture provides a default set of templates (displayed in screenshot), which generate a .Net n-tier web application. See Application Architecture for details.